Exercising while sick: Listen to your body and rest! Author St. Joseph Mercy Health SystemPosted on January 19, 2015 January 19, 2015 Categories UncategorizedLeave a comment on Exercising while sick: Listen to your body and rest! The start of 2015 marks my first days on the job as regional president and CEO of Saint Joseph Mercy Health System. From my family to yours, I hope the New Year brings you much joy, good health and personal growth. As I begin this journey, my mind is filled with goals and resolutions! I want to take this opportunity to introduce myself to those who may not know me, and share my vision for a healthier and more vibrant community. Having worked with SJMHS colleagues and physicians across southeast Michigan over the past six years, I can honestly say the industry’s brightest and most dedicated people work here. Our hospitals are exceptional at treating complex medical conditions, ranking among the best in the country for clinical outcomes and patient safety. We also want to be the best in the country at reducing risk and improving health. Therein lies a great opportunity for us to change lives for the better. As health care professionals, we know the statistics – obesity and diabetes rates on the rise, life expectancy lowering*. The best way to improve the health of our communities is from the inside out. I have a vision for a healthy and active workforce. To further our message, Saint Joseph Mercy Health System is embarking on a “Journey to Better Health.” Please think about the goals you can make to improve your own health and become more involved in the communities we serve. With your support and engagement, this journey is going to be remarkable for us all. I invite you to visit www.stjoeshealth.org/joinme to learn more. We have a strong foundation with which to accelerate our efforts. Across SJMHS, there are farmers’ markets, 5Ks, bike rides, classes, wellness events, sports teams, walking groups, Weight Watchers at Work, HMR weight management programs and more. Our hospitals have been tobacco-free longer than any other hospital in the state. We are leading the way in the communities we serve. Our partnership with Eastern Market in Detroit puts nutritional education and farm-grown produce on the tables of those who need it most. We’ve partnered with the Detroit Red Wings to identify healthier menu options for fans. We’re helping people improve their health through weight loss programs, smoking cessation, wellness events and health screenings. We help athletes rehabilitate from injuries and encourage families to get moving together. I am honored to have this opportunity to work with all of you. We have much to do to build on our collective strengths of connected hospitals, outpatient centers, physician offices and programs for the poor and underserved. By our example, we will be a transforming healing presence in the lives of those we serve. It starts with our own health. Take the journey in 2015. Join me. 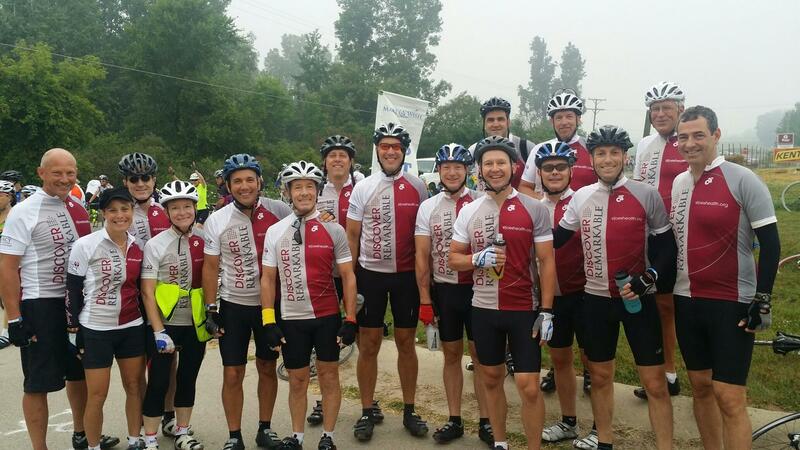 Author St. Joseph Mercy Health SystemPosted on July 29, 2014 Categories Team Joe'sLeave a comment on Thank you, riders! Team Joe’s hung together all day as we headed into MIS. Sure made taking pictures easier! More importantly, we could soak up the beauty of our last day. Getting out of bed for the last day of WAM is a feeling that words just don’t do justice. The body is tired (and likely sore in certain areas), it is dark outside (we typically get up around 4:30am) and the thought of putting your rear end back on the bike seat is the farthest thing from your mind. But you also have a feeling of excitement about what the day will bring – the finish and the Heroes Hurrah that celebrates our wish kids that completes our journey that began last Thursday morning. So, with all those feelings, Team Joe’s was ready to roll with some of our group hitting the road at 6am and some following at 6:30am. We were missing Rosalie, Ralph and Alex which was sad but they had a family wedding and family always comes first. It was time to meet our adopted wish hero – Jessica H. All of us wore a bracelet with Jessica’s name for the entire ride. She was a delightful young lady who had just had her face painted like a Tiger. Jessica’s wish was to “swim with dolphins” and she got her wish last May. She is resilient and “one tough cookie” as her Mom described her. She suffers from SMA (spinal muscular atrophy) but she refuses to be defeated. Seeing her courage and determination made all us realize that 3 days and 300 miles on a bike was nothing. Jessica took photos with us and also gave each of us our own medal of accomplishment. The emotions were running high as this was truly the highlight of our WAM. As I wrap up, let me thank all the members of Team Joe’s for agreeing to be part of this great event and this great cause. We rode for kids who have had their childhood stolen away by life threatening illnesses and families who have to watch their children go through some very difficult challenges. We rode and raised money to grant wishes to these amazing kids and I am proud that St. Joe’s and Team Joe’s supports these kids. We had many new members of Team Joe’s along for their first ride. I know each came on with much apprehension and each wondering if they could actually ride the 300 or the 50 miles and now they know they can! In fact, my money is on them all coming back. That is a wrap for WAM2014. Thanks to all of you who supported Team Joe’s with donations, prayers and support. Although each day of the WAM is unique and special, Day 2 is both the longest riding day and the longest day in total from start to finish. We start the day with riding and we end it with the annual WAM awards event called the WAMMIES that we hold in the Dewitt High School auditorium. By the end of the day, we were all physically and emotionally drained but left each of us with a feeling of being part of something bigger than any one person or team. It was a day that grounds us in why we are out here riding – for the kids. And although the last thing we want to think about is getting back on the bike for another 93 miles tomorrow, today’s experience will make that riding that much easier. For most of the team, riding started at 6:30am. Rosalie, Alex and Ralph left at 6am because they needed to finish as early as possible because they have to leave WAM to go to a family wedding on Saturday night. Personally, I can’t imagine doing that but that just tells you how dedicated Rosalie and her family are because many would have just canceled out on WAM. We will miss them tomorrow for sure but know they will be in our thoughts. Given today was 109 miles, we needed to pick up our pace and we lucked out in joining a group of riders and formed a large group (like a peleton if you are into the Tour de France) and we moved at a quick pace for the first three hours. As we started our ride today, we were staring at a beautiful double rainbow with a large storm cell sending lightning bolts in the background. After admiring the rainbows, the cell moved in and we rode in a downpour for at least 2-3 miles. But, after the rain stopped, the wind helped dry us off and we had nothing but perfect weather the entire day. In fact, it got humid and hot and fluids were going fast. When we finished around 2:30pm, we realized that we did 109 miles in the same time it took us to do the 99 miles the day before – that would be because today was long but fewer hills (thank you God). After we finished, it was time to get changed and back to the high school for dinner and the WAMMIES. This is a sprited awards show that always spotlights our wish kids. Tonight was no exception and we were treated with two wish kids acting as hosts of the show, 30 wish kids on stage with the stories of their Disney wishes. Then, at the end of the show, the Make-A-Wish staff arranged for a young man, Quinton, to received his Disney wish at the awards show. How cool. Here is a cute shot of Quinton peeking out the window. Team Joe’s was one of the top fundraising teams on the WAM. This year we beat our $50,000 team goal and now stand over $53,000 . Many of these dollars are from our St. Joe’s family and, for this, please accept a heartfelt thanks. Jodi snapped this one as our day ended reciting “Red sky at night, sailors delight.” Let’s hope that holds true for our last day. Here is a nice pic of Jodi Talbott and Nick Graham. Jodi is an RN in the Ann Arbor ED. Awesome pic by David Steinberg at the start of Day 2 with Rob Casalou in the foreground and a double rainbow as we headed into a storm. Good news is that it rained hard for only a couple miles with beautiful weather the rest of the day. Rob and Tom Mihalski holding each other up at a breakstop. Sunscreen is a must on the WAM as shown by Tom Mihalski. Nick and Jodi still smiling after two days on their first WAM. Ralph, Rosalie and Alex deep into Day 2. We are sad that the three of them will not be able to finish with us on Day 3 because of a family wedding tonight. So we told them to wear their Team Joe’s jerseys. The rest of us will wear the team colors tomorrow. Ro and Alex. It was great seeing Mom and son riding for wishes together. Nick, Jodi and Russ at the mile 27 break stop. We have had it all this morning – rain, lightning, sun and a morning rooster cheering us on. Quick pace so far. Ride on! Russ Olmsted, Rob Casalou, David Steinberg and Lee Benjamin at breakfast to begin Day 2. David is hoping that (dietitian) Lisa McDowell does not see what is on his plate this morning! it would not pass the heart smart test. no worry, it will be burned off within the first couple hours. It is early and wheels will be on the road by 6:30am. Weather forecast looks better!